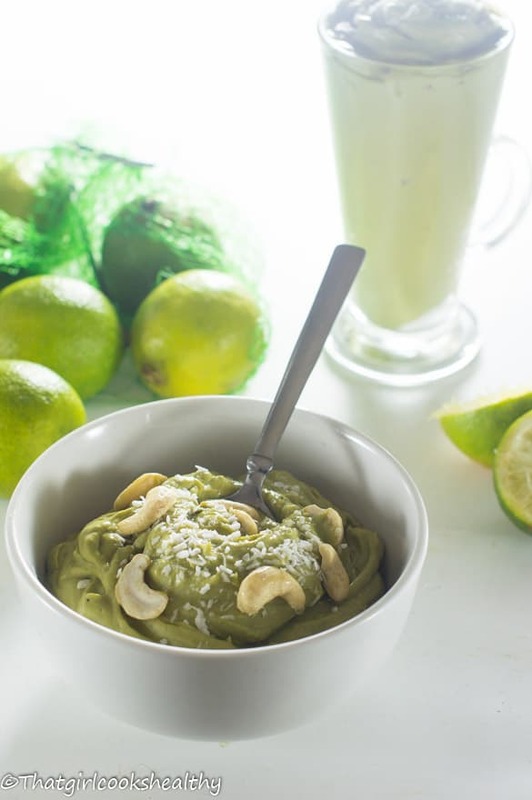 Key lime pudding – this key lime pudding is a great alkaline friendly dessert. 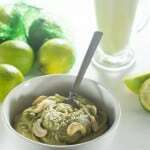 Made with limes, zest, avocados, coconut nectar and vanilla pod. What do you do when you’re absolutely inundated with a bunch of avocados? You put them to good use by making some key lime pudding that’s what you do with them. Seriously, I’m not even exaggerating, my fruit basket is completely hijacked by avocados right now. I don’t know about your location but I can tell you right off the bat that avocados are extremely expensive in the UK. Granted you can shop around and purchase them singularly for a reasonable amount of money, but I prefer to buy in bulk, leave them until they’re firm/ripe and then dive right in. This huge amount that I’m referring to was courtesy of Costco. I didn’t purposely go there to pick some avocados, it was a impromptu last minute decision which I’m pleased about. I do recommend purchasing not just avocado pear but in fact any fruit or vegetable in bulk as this save times and money in the grand scheme of things. Depending on the produce, you could always chop it up at it’s peak, freeze and consume at your leisure. 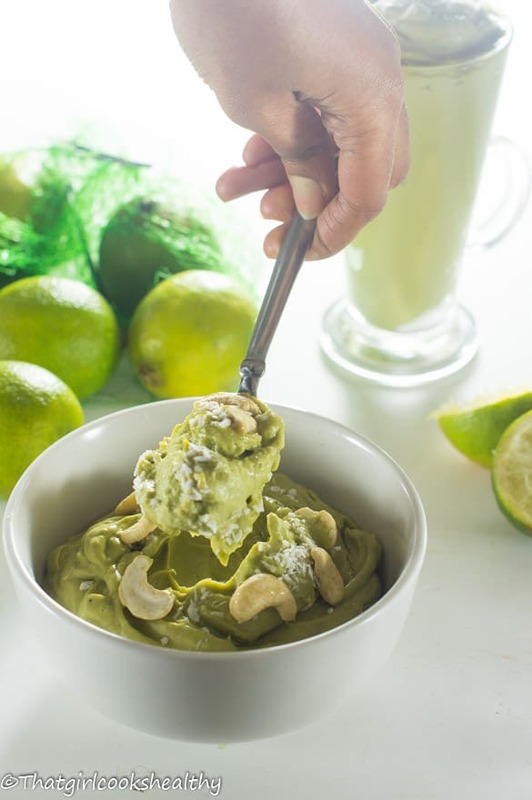 Key lime pudding is quite an interesting mix, firstly if you’re not a huge fan of avocados – be it as a pudding or otherwise, then you’ll have to sit this one out and secondly. I would summarise the pudding as quite tart or zesty because of the use of both the rind and the juice of the lime – that’s a double serving of vitamin c, don’t forgot that. I must admit I’m not the greatest fan of a zesty dessert. 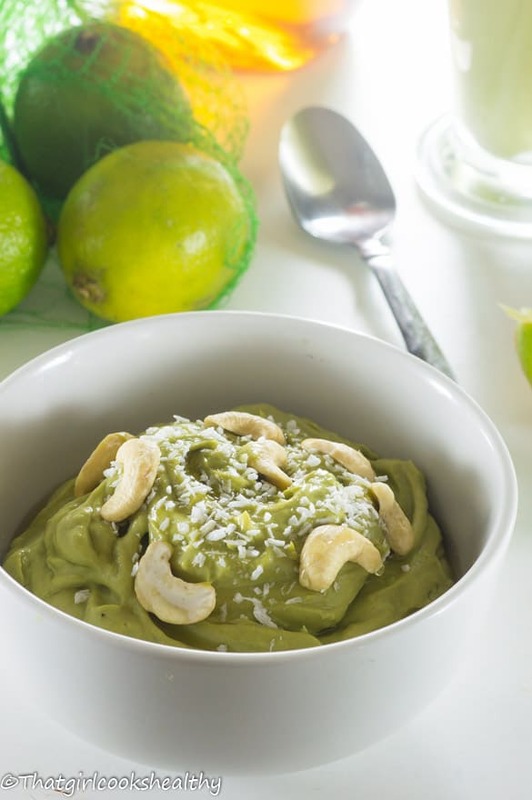 I like them to be subtle in taste and certainly not overpowering which is exactly what this pudding is, a subtle hint of lime whipped into the sweet creamy texture of the avocado. Do make sure your avocados are ripe and slightly soft to the touch prior to use. In terms of how sweet you want this pudding to be I found using 4-5 tablespoons of a low glycemix index sweetener such as maple syrup, raw agave nectar or coconut nectar was suffice. However, you may want to include a tablespoon more, just go with your own preference there. This key lime pudding is a simple but tasty recipe to make, you have make it overnight or even on the same day as it doesn’t take very long to prepare. I think the longest task will be removing the skin from the avocados and grating the lime zest and the rest is simple. 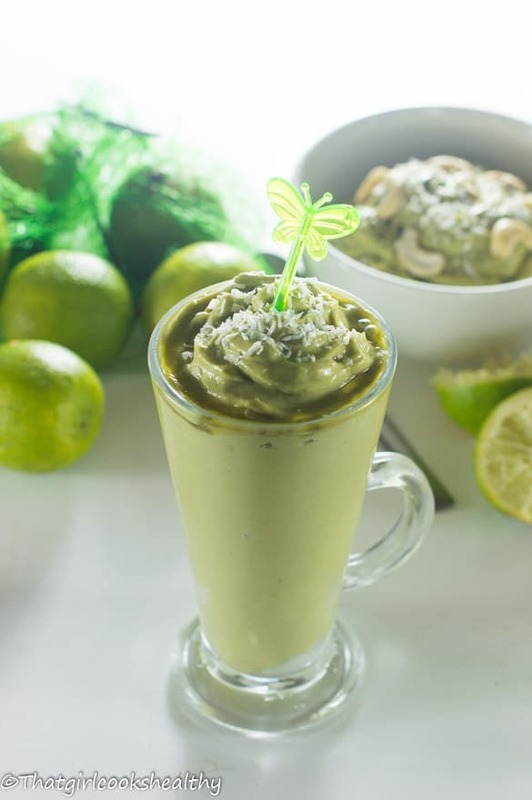 Add all of the ingredients to a high speed blender and blend into a smooth consistency. Renz I swear island people are SO boring when it comes to pear. All we do is peel it and eat it. You gotta try this recipe though, it’s yum! Oh Wow! What an interest pudding Charlene. I have plenty of avocados rutting away. Can’t wait to give it a try. Looks really SCRUMPTIOUS!!! Hey Imma, thanks girl. Yes please do give it a try, it has an acquired taste but definitely your type of thing if you like a citrus flavoured pudding. Oh my word I bet this is delicious! I could live on avocados (and practically do!). It would be fun with some of that whipped coconut cream (like whipped cream) on top too! Thanks Debi. I was so tempted to add some whipped coconut cream and the top. I knew I should have went ahead with that idea lol. Oh yum, I love everything avocado 🙂 But I have to admit, I haven’t tried it with lime in a dessert before – will have to check it out! Thank you Donna, this is definitely a must try! That’s a combination I never would have dreamt up! Beautiful color — and so healthy! What a great idea for avocados! I love the idea of pairing them with lime as a dessert and natural creaminess of the avocado would make a great pudding. Thank you Annemarie. I hope you sample this delicious recipe when you get the chance.